The value of New Zealand’s residential property market has soared to almost $1 trillion dollars yet there are still suburbs in each of the main centres that offer more reasonable pricing. New data from the Property Institute and property market data company Valocity shows that, taken as a whole, New Zealand housing is now worth $941,611 billion. This is as compared to $667,718 in 2015, which points to a significant jump (of 41.07%) in values nationwide between 2015 and 2018. While residential housing values are up in all the main centres, the growth in values has been uneven. Tauranga saw the biggest growth in values (up by 63.27% to $34 billion) while Christchurch saw the most moderate growth (up 11.6% to $60 billion). Apart from Hamilton, in each of the main centres value growth in 2017 was the same as, or greater than it was in 2016. Property Institute chief executive Ashley Church says this was the biggest surprise in the report as there’s been a general consensus that the market has been flattening. “This data suggests that it’s more a case of growth moving away from Auckland to other parts of the country. “That’s not entirely unexpected as house price booms in regional centres usually start later than Auckland and continue for a while after a boom in Auckland has ended. “But the extent of the strength of those prices, particularly in Tauranga and Wellington, is still surprising”. Thanks to this value growth, many people who own property are now wealthier than they were three years ago, but Church says the new data isn’t all good news. Not only is it even harder to get into the market than it was three years ago, but the economy has now become even more sensitive to interest rate increases, he says. “To the extent that this increase in prices is mortgage funded we’re now that much more susceptible to a major hit on the economy if interest rates were to increase too much over the next few years”. However, despite the steep rise in values in markets across the country, the data also shows that each of the main centres has the odd, more reasonably priced suburb. 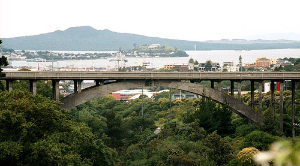 • In Auckland, it’s Grafton which has a median value of $382,000. • In Wellington, it’s Timberlea with a median value of $369,000. • In Christchurch, it’s Aranui with a median value of $281,000. • In Tauranga, it’s Gate Pa with a median value of $445,000. • In Hamilton, it’s Nawton with a median value of $417,000. • In Dunedin, it’s Purakaunui with a median value of $214,000. Some confusing figures here, thanks to the ‘long’ trillion (a million cubed - 10^18 or ‘exa’ - used in Europe) and a ‘short’ trillion ( a million squared - 10^12 or ‘tera’ – used in the United States and now normally used in finance). If we take the figure of housing worth $941,611 billion, ($941,611,000,000,000) this will translate to $941 trillion, so your first sentence should read “The value of New Zealand’s residential property market has soared to almost $1 quadrillion dollars.” A short quadrillion is 10^15. Wikipedia’s entry on ‘Orders of magnitude’ should help.